I can think of no better day to consider the battle against evil that we face daily than Halloween. Tonight, streets will be filled with happy children expecting candy at every door they knock on. These may be dressed up as goblins, demons, vampires, ghosts and witches. Certainly, most of these are imaginary characters and we are cognizant of that. However, demons are real. When you see these children begging for candy, let it be a constant reminder to you that we are in a much bigger battle than what the eye can see. How do we win the battles we have in life with demonic forces? Thankfully, we are not left in the dark concerning that. In fact, the very passage before us empowers us to win these spiritual battles if we will only heed to the Word of God. As members of God’s army, we must arm ourselves with the equipment God has supplied to us. 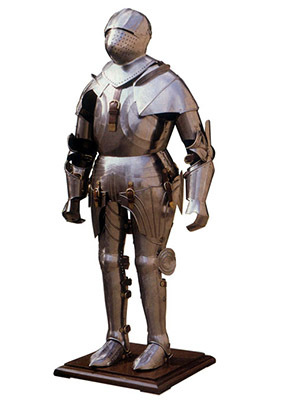 This equipment is called “the whole armor of God”. First of all, we must have “the truth” (vs. 14). It is simply impossible to stand against the devil without the truth. Jesus said, “…the truth shall make you free” (John 8:32). Nothing has changed here. Truth cannot be set aside for any purpose. If we are to battle Satan, the truth must be fought for. Next, we must put on the “breastplate of righteousness” (vs. 14). Children of God cannot flirt with the sin. This is the armor of the opposing forces. We must take a stand for what is right! Jesus set the greatest example of doing right. As He is our great Leader, we must follow Him in this! Thirdly, we must certainly prepare ourselves to share “the gospel of peace” (vs. 15). It’s unthinkable that a soldier would ever go to war without some type of training. And yet, many children of God try to battle demonic forces daily without the proper training. We get our training in regular church attendance as we fellowship with the saints. We ask for help when we pray to our Lord! Next in line, we are to put on the “shield of faith” (vs. 16). Certainly, this begins with the gift of faith that God gives to us. However, we must build up from that. Without the proper training, faith will not be built up. Many people enter the army with certain physical gifts. The army seeks to find these talents and enhance them. As believers, we must seek to strengthen our faith daily! Lastly, we must put on the “helmet of salvation” as we wield the “Word of God” (vs. 17). Understand, God’s Word is not our sword. It is the “sword of the Spirit”. We are merely to share it and allow the Lord to use it as He sees fit (Isaiah 55:11). Child of God, every time you see a child dressed up this night, remember that our battle is bigger than our physical eyes can see. We battle against demonic forces every day whether we realize it or not. Pray to the Lord now that He will help us as we seek to put on the armor He has graciously supplied.